VE (Victory in Europe) marked the official end of hostilities in the European theatre of operations and quite possibly the largest and most joyous celebration in human history. Unless, of course, you happened to be former US Army Air Forces Private George Edward Smith. While most of the rest of the world basked in the joy of victory and the relief of the European war being over, Private Smith had a rather more pressing engagement to think about. The rest of the population might be about to enter a brave new world, but Smith was about to depart rather suddenly from the old one. It was his execution day. Smith, previously serving at RAF Attlebridge in Norfolk with the US Air Force’s 784th Bombardment Squadron, wouldn’t be celebrating the end of the European war. 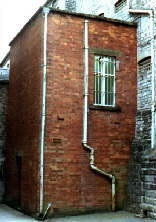 He’d be watching the clock tick relentlessly down to 1 a.m. when he’d be escorted from the Condemned Cell at Her Majesty’s Prison, Shepton Mallet, Somerset (loaned to the US military for the duration of the war). He’d be sat near the gallows pondering a past that was about to cost him his life while hoping for a reprieve that wouldn’t arrive and a future that was already lost. While most of the world celebrated, George Edward Smith was going to die. Smith’s guilt wasn’t in any doubt. Near RAF Attlebridge lay the sleepy Norfolk town of Honingham and the stately home named Honingham Hall (demolished in the 1960s). Honingham Hall and the adjoining land were home to distinguished diplomat Sir Eric Teichmann, a long-serving figure vastly experienced in the Far East and serving as advisor to the British Embassy at Chungking. He’d noticed, as so many country gentlemen do, that he had a problem with poachers. December 3, 1944 would be the last time he had a problem with anything. It was in the small hours of the morning that he met George Edward Smith. Smith and his accomplice Private Wijpacha had ‘borrowed’ a pair of M1 carbines from the base armoury and decided to do a spot of illicit hunting. Teichmann, familiar with the fact that poachers aren’t usually violent offenders and will usually run if challenged, heard gunshots from nearby woodland and went out to investigate. He went out unarmed, challenged Smith and Wijpacha — and Smith promptly shot him once through the head with his M1. Both men fled hurriedly back to their base, hoping that their absence wouldn’t be noticed. Of course, a senior British diplomat lying murdered in the woodland was noticed. Before long both men were arrested and questioned, during which Smith confessed, a confession he later retracted claiming that it was made under duress. That, not surprisingly, cut no ice whatsoever with either the American military or the British authorities. Smith and Wijpacha were court-martialled at RAF Attlebridge and Wijpacha (who hadn’t fired a shot) received a lengthy prison sentence. Smith, the triggerman, drew the death penalty. Under the Visiting Forces Act, 1942 the Americans were free to try, imprison and condemn their own criminals independent of the British system of justice, not that it would have made any difference to Smith’s case. Murder was then a capital crime in Britain regardless of the criminal’s nationality. If Smith hadn’t been condemned by an American court-martial then a British trial would have seen the judge don the legendary ‘Black Cap’ and pass what British reporters once called ‘the dread sentence’ especially given the status of the victim. Smith was promptly shipped to the prison at Shepton Mallet in the county of Somerset to await a mandatory review of his case and, if clemency was refused, execution. Shepton Mallet had been a civilian prison for centuries before being turned over to the British military, who then lent it to the Americans as part of the Visiting Forces Act. 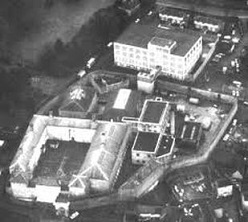 Until its final closure a few years ago Shepton Mallet remained the oldest prison in the UK still operational, a dubious distinction now belonging to Dartmoor. There were, however, a few difficulties with the arrangement. The Americans carried out 18 executions at Shepton Mallet during their tenure between mid-1942 and September, 1945. Two (Alex Miranda and Benjamin Pyegate) were by firing squad, upsetting local people, who knew very well what it meant to live next to a military prison and hear a single rifle volley at 8 a.m. The American military also preferred hanging common criminals to allowing them to be shot like soldiers. The problems were simple. The locals didn’t like firing squads made no secret of it. Not surprisingly, there were complaints. The US military felt being shot was too good for most of its condemned and the British didn’t like the methods and equipment used by American hangmen, who had acquired a nasty and thoroughly-deserved reputation for using badly-designed scaffolds, the wrong type of rope and the antiquated standard drop instead of a drop length scientifically calculated by the prisoner’s weight. The British also regarded American hanging equipment as outdated, while American military hangmen John Woods and Joseph Malta were entirely unfamiliar with the British kit. And British hangmen had evolved hanging to almost an art, needing mere seconds to complete the procedure. Another problem was that the gallows at Shepton Mallet hadn’t been used since March, 1926. By 1942 it was considered unfit for service and needed replacing. A compromise had to be reached, and was. The Americans could continue executions at Shepton Mallet, but the vast majority (16 out of 18) were performed by British hangmen using a British gallows in an extension built onto the end of one of the cellblocks. The Americans were permitted their usual practice of having the condemned stand strapped, noosed and hooded on the gallows while their death warrant and charge sheet were read out and then being asked for any last words. This caused executioner Albert Pierrepoint, master of the speedy hanging, to complain at what seemed to him a cruel, unnecessary delay in ending the prisoner’s misery. Pierrepoint also complained about overcrowding in the gallows room during executions. At a British hanging there would be the prisoner, the hangman, his assistant, the prison Governor, the Chief Warder, the doctor, the Chaplain and two or four prison officers. At an American military hanging there were usually twenty or so people clustered around the trapdoors and lever. He felt a hanging should be both quick and perfect and that a crowded gallows room invited disaster. By VE Day the arrangement was well-established. 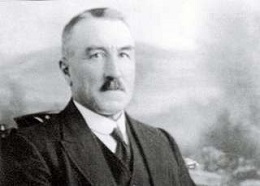 Thomas Pierrepoint, uncle of Albert and brother of Henry (both of whom were also hangmen) performed 13 of the 16 hangings at Shepton Mallet while Albert performed the remaining three when he wasn’t busy elsewhere. Their assistants were Steve Wade, Herbert Morris and Alexander Riley. Tom Pierrepoint had performed the last hanging at Shepton Mallet in 1926 (that of murderer John Lincoln) assisted by Lionel Mann. While the two firing squads were performed at 8 a.m., the hangings would be carried out at 1 a.m. which was discreet enough not to arouse neighbors’ ire. Smith’s case was reviewed. Not surprisingly, his appeal was denied as were other requests including (most generously, under the circumstances) one from Lady Teichmann, widow of his victim. His date was set for 1 a.m. on what turned out to be the very day Europe’s guns fell silent. Tom Pierrepoint would do the job assisted by Herbert Morris. Smith was transferred to the Condemned Cell a few days prior to the execution date where he was granted free access to the military Chaplain. When the time came, while the rest of the population celebrated the arrival of a new world and Smith contemplated his departure from the old one, it went as smoothly as could be expected. Smith was taken from his cell wearing standard military uniform, from which any badges or flashes marking him as a soldier were deliberately removed. Paperwork was completed signifying his dishonourable discharge from the US military as a common criminal and the US military were determined that he should die like one. Given the delays caused by the reading of the charge sheet and death warrant and Smith being asked for his last words (he apparently had none) it took 22 minutes between Smith being taken from his cell and being certified dead by the prison doctor. Compare this with a standard British execution (minus the bureaucracy and speechifying) where 22 seconds would have been considered twice as long as was needed to do the job. Smith’s punishment, however, wasn’t done yet. Executed American servicemen were initially buried at Brookwood cemetery, but then moved to the notorious ‘Plot E’ of the Oisne-Aisne Military Cemetery in France. Plot E is deliberately hidden from the rest of that cemetery. Its residents have no names on their graves, only numbers. They have no headstones or crosses, only flat stone markers. No American flag hangs in their plot. It doesn’t appear on the plan of the cemetery even today and the markers are placed facing away from the graves of other Americans. Visits to Plot E are still discouraged and it wasn’t until a Freedom of Information request in 2009 that the names of those buried there were released. 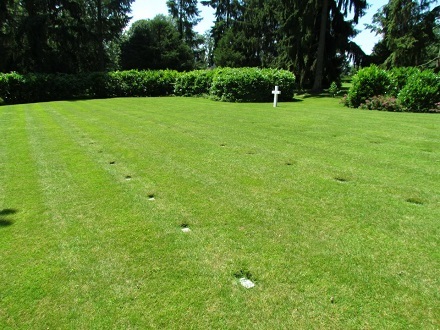 A view of the “Dishonored Dead” in Plot E, Oise-Aisne American Cemetery. (cc) image by Stranger20824. Whatever they may have done, and some committed truly dreadful crimes, it seems distasteful to virtually deny their existence and shame them even after death. It also denied their families and friends the chance to visit and grieve, despite the fact that they themselves had committed no crime. Prisoner at the Bar, it is the sentence of this Court that you be taken from this place to a lawful prison and thence to a place of execution where you shall be hanged by the neck until you are dead, and that your body be afterwards cut down and buried within the precincts of the prison in which you were last confined before execution. And may the Lord have mercy upon your soul. Fascinating information about “Plot E”.